Here`s some information about something to do in the evening in Kurokawa,it`s called`bar-hopping`. Here`s the original (in mini form!) Japanese leaflet,followed by my summary of the important bits in English. You can pick up a (Japanese) map at the Visitor Center showing the 22 the different locations ( mostly Ryokan,but including two restaurants and a shop) and a short description of the type of drink and snack you can expect. I`ve also included a brief description of the drinks on offer in English below. `KAPPO ZAKE` BAR-HOPPING IN KUROKAWA ONSEN! WHAT? A special bar-hopping pass made of wood (kappo tegata かっぽ手形）is available for ¥1500 from the reception of most inns and Visitor Center. WHERE? 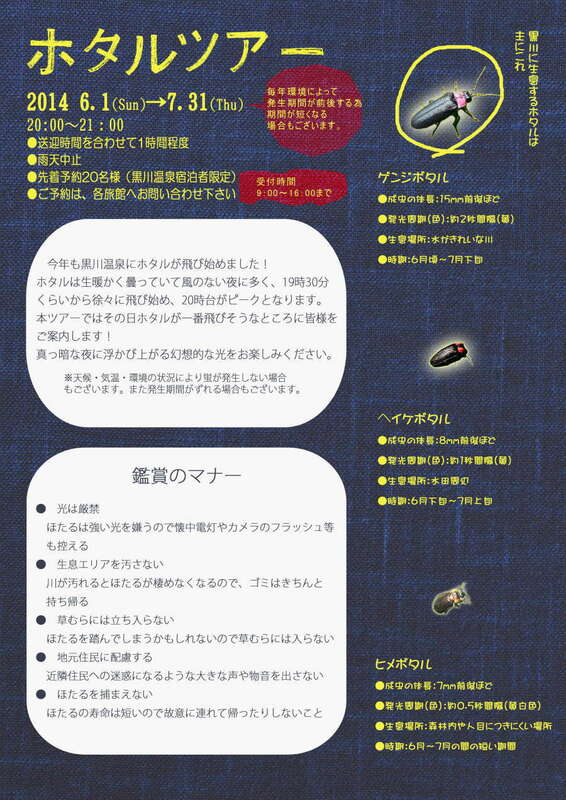 Visit any 3 of the 22 inns,restaurants and (one) shop featured on the accompanying Japanese leaflet. HOW? Just present a valid pass,staff will remove one seal and you will be shown to the designated bar-hop area, given a bamboo cup (kappo) of sake or shochu and a small Japanese-style snack (tsumami) to go with your drink. AGE LIMIT? Yes…you have to be over 20 to drink alcohol in Japan,but a non-alcoholic drink can be requested. Please look at the corresponding numbers on the Japanese map to locate each establishment and plan your bar-hop. DON`T DRINK AND DRIVE! On the other side of the leaflet you can also see a photo of the type of drinks and snacks offered. Usually the pictured snack and the drink described below will be served,but at certain times this will vary. CHEERS! Or as they say in Kurokawa KAPPO!!! If this kind of activity proves popular it will probably continue through the late summer and autumn,but it currently seems to be running for a trial period. It looks like fun,as otherwise there isn`t that much to do of an evening in Kurokawa (well,apart from hanging around your Ryokan,relaxing in your room or taking dips in various baths!). The purchase of a `Bar-hopping` pass together with an `Onsen-hopping` pass could prove an interesting combination…..but you`d better make sure you can find your way home afterwards! A little way out of town and off the beaten track lies peaceful Waraku Inn （和らく　number 22 on the Onsen map). At the outdoor baths of this small inn you are unlikely to be disturbed by a coachload of fellow bathers,or by anyone at all for that matter ,and on the late weekday afternoon I visited I only saw one other onsen-goer. The route to the bath from the inn first leads through a garden area,then down steps (right side for women,left for men,although the sign is changed over at 3pm every afternoon). I discovered almost too late that this is a `go before you change` bath…..the toilets are located in a different building to the changing rooms, back at the top of the steps! So remember to `go before` you start getting undressed… this arrangement is true of several baths I have visited recently. The women`s bath was quite spacious and I was intrigued by the powdery white sediment deposited on the surfaces of the rocky bath. This is harmless and a deposit of the sulphur hot spring waters that run into the baths here, which also have that distinctive smell of bad eggs! At this time of year the fresh green of the maple leaves overhead is particularly uplifting,my fellow bather noted. She also hoped to be able to come back in the Autumn to see the changing colours of the leaves. This is one bath that I would also love to visit at least once each season,as I`m sure it is quite a different experience in each of the four seasons. A sign in one area of the bath near the water gushing into it warned that the water there was scalding hot,but an area on the other side notified bathers that it was a relatively cool 38°C. Funnily though,I am enjoying quite hot baths even on these humid June days , I had felt very hot and sticky on the day I visited Waraku,but on leaving I was feeling very refreshed and relaxed and ready for my evening classes. Sadly,although I was invited for a drink in the cafe area I had to go straight off to work. Would I visit again? Yes, for the Autumn foliage. To note: Quite isolated,may be too quiet for some? FREE outdoor bathing day in Kurokawa Onsen ! WHY? It`s a kind of play on words… The number 26 can be read in Japanese as `fu ro`,which also means `bath`. So go ahead and enjoy a free bath on this especially significant date in June! Just pop into the reception of the ryokan first (rather than go directly to the bath) and they will show you the way. 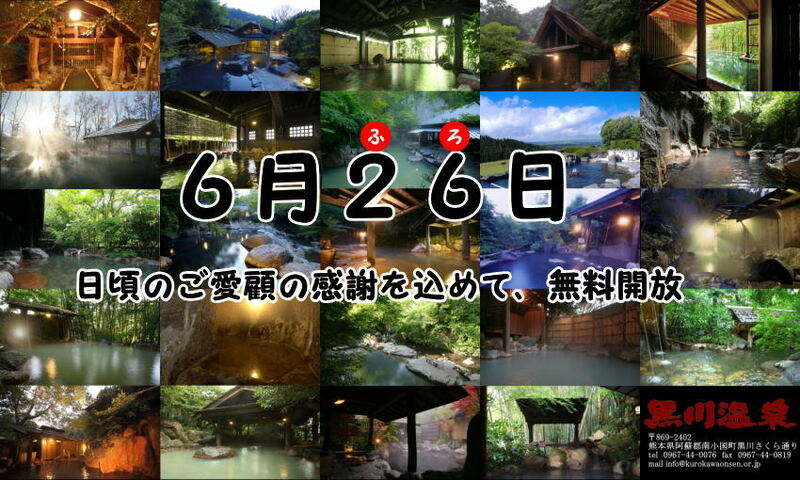 Just noticed that the Heisei year is also 26,so the date for this free bathing extravaganza is actually 26/6/26 . So book a day off,grab your towel and head for Kurokawa!